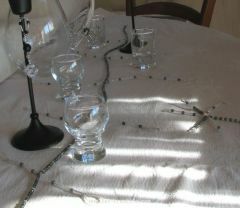 In a few steps, here's how to make a long table garland for a Black and white Christmas decoration, but to soften the impact of the Black, we'll be using gray and gold effect Montana beads together with Crystal AB (transparent crystal) beads. This garland is unusual in being fairly extensive, since 5 other smaller garlands pass through it at 5 different points along its length, with each crossing-over point being decorated with a fastener in the shape of a silver bow tie. Cut a 40 inch length of bead stringing wire (needed in order to give flexibility and strength to the garland, because the beads are too heavy for just a normal nylon thread). Make a loop with the seed beads and fasten it tight by passing the 2 ends of the thread into a crimp bead (leave an inch or two of thread over, the first beads threaded on will hide the 2 threads). Flatten the crimp bead with flat gripping pliers. Thread on faceted beads along about 6 inches (alternating between 5 Gray Montana faceted beads and a small faceted Crystal bead). Then thread on a crimp bead and pass another length of thread about 9.4 inches long through it, flatten the bead at a point half-way along this length of wire. Place a 'bow tie' fastener diagonally on top and tighten well. Thread beads on to both sides of the shorter length of wire: about 8 to 10 small faceted crystal beads, then a Gray Montana faceted bead and so on... thread some beads a little at random, you'll like the effect created... Stop threading about 1.6 inches from the end so as to make the end loop: first thread on a crimp bead, then about 22 to 25 seed beads and bring the end of the thread back through the crimp bead and the beads that come before the crimp beads, pull tight and flatten the crimp bead. Continue, leaving a space of around 10 inches between each smaller garland that crosses through the main garland. 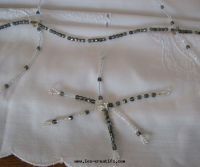 Make a second smaller garland with a length of bead stringing wire around 10.6 inches long, as well as a small central garland, about 14 inches long. The last 2 garlands should be symmetrical with the previous garlands and of the same size. Ready-to-use or to offer as a gift, it's in the "Jewelry and Beads", store that you'll find this long table garland and Christmas starready to be put into pride of place.